I asked this question on Stack Overflow before I realised this site existed. As this site it more appropriate, I'll ask it here too. However GDAL is installed correctly and the header file is located at /usr/include/gdal/cpl_port.h. Is there some environment variable for GDAL that needs to be set in order for pip to find the header files? The compilation ran to completion and I have GDAL in my virtual env. Phew! Τhe header files cannot be found for some reason. Maybe you you are operating inside a Virtual Enviroment or they are not where they should be for some reason. In any case you can specify the include dirs when installing gdal via pip. GDAL provides nice toolkit for GEO related operations. However, installing it to virtualenv on Linux is not trivial task. This recipe describes, how to do that. here I use lowercase gdal for Python package and upper case GDAL for general system wide library. There are multiple methods for installation. One requires compilation and takes few minutes more. The other is using wheel package of pygdal package and is very quick. Anyway, to create the wheel package one needs to create it once and the creation includes the compilation step anyway. GDAL is general C(++) based library for GEO related calculations. GDAL utilities can be installed system wide what makes shared libraries available, but does not install Python package itself. GDAL comes in different versions and each Linux distribution may by default install different version. Python package gdal requires compilation and is not trivial to install on Linux based systems as it expects few environmental variables to be set. This makes installation into virtualenv more difficult. Each gdal version might assume different version of GDAL and will fail installing if expected version is not present in the system. Python package pygdal is alternative to gdal, which installs exactly the same stuff as gdal, but does it in much more virtualenv friendly manner. pygdal comes in versions reflecting related GDAL version. So having GDAL version 1.10.1 in the system you shall install pygdal version 1.10.1. Python package gdal (as well as pygdal) uses root python package named osgeo and has set of submodules, one being osgeo.gdal. If needed, other than default versions of GDAL can be installed and used. This is out of scope of this description. Wheel packages can be cross-compiled, this is also out of scope. As pygdal requires GDAL shared libraries to be present, we must install them first. Now you know, GDAL is installed and the version is 1.10.1 (the version can vary). Currently pygdal is provided only in tar.gz package, which contains package sources and requires compilation. It may take a while to complete, is it needs numpy, which may also require some compilation. Just wait. From now on, you may use osgeo package in your Python code as you like in exactly the same manner as if you would install it by gdal Python package. In our case, it must also match the version of GDAL installed. Following steps can be done in virtualenv or not, as you like. and wait, until it completes. Installation from wheel formatted packages is much faster (a second compared to minutes), as it does not require compilation. Note, that directory with wheel packages can have any name, we will use just the name wheelhouse. Ensure, you have in wheelhouse directory both required wheel packages (for pygdal and numpy). Ensure, GDAL is installed and the version matches version of pygdal. The -f wheelhouse shall point to the directory with whl files. There is no need to install numpy, it gets installed automatically. The problem with the pip installing gdal is that it only gets the bindings, not the entire library, so it can get tricky. One way to solve it is to use the pip command to download - but not install. Then you tweak the header location from the config file. Then you pip install that. meh. I was having the same problem but realized that writing a fabric script to recompile gdal and generate the python bindings was going to take less time. You even get the benefit of filegdb with that. Go ahead and use tha gist I wrote or tweak it to your hearts content. While a while later, this provides the include path without having to bail out of pip installation: One can set the include path using an environment variable. Now you can use virtualenv and setuptools friendly version of standard GDAL python bindings pygdal. Firstly, I set up a virtual Python 2.7 environment using virtualenv. The Python distribution was installed in a directory called 'env'. I also installed gdal-dev but this may not have been required since it might have already been installed with gdal. That seemed to work for me but I haven't tested installation yet. I was getting a similar error while trying to install the python GDAL bindings on a mac (OS 10.10.5). I installed the base GDAL software from http://www.kyngchaos.com/software/frameworks using the "Complete" download. I had to set three environment variables. The final piece was to add /Library/Frameworks/GDAL.framework/Programs to my PATH. After that pip was able to install GDAL for python. Hope this helps. Beware that pygdal may require a different version of GDAL, compared to what the GDAL package of python bindings requires. Below is what I used to get it on recent versions of Fedora (20 and 23). This obviously assumes the location of the header files is /usr/include/gdal. 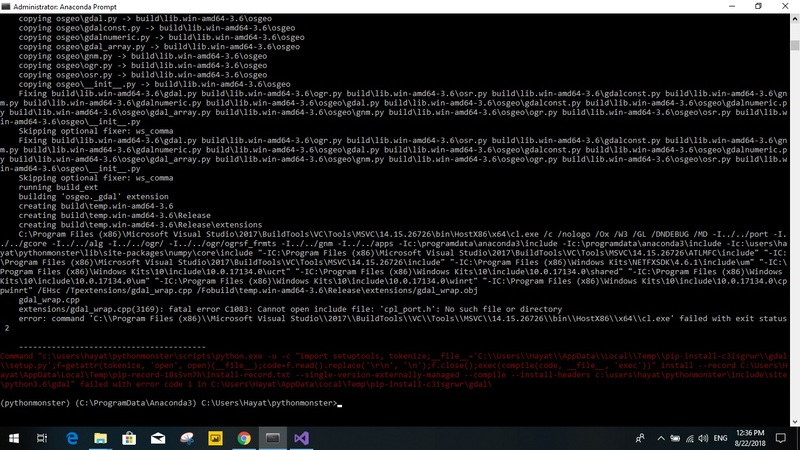 In order to install GDAL with the pip command above, the version of the header files need to be similar to the version that pip will do the build. GDAL has an updated binary reference at: https://trac.osgeo.org/gdal/wiki/DownloadingGdalBinaries. I've had same problem on Windows 10. After some experiments I came with this solution. If you're using Docker we open sourced our container, that simplifies using GDAL and Python 3. The container captures the steps outlined above to allow you to quickly use GDAL with your apps. You may also encounter problem whith memory usage. When running pip install gdal==2.2.3 gcc is launch to compile something and it raises memory usage. To fix it, you need to add more ram or free some. Not the answer you're looking for? Browse other questions tagged python gdal ubuntu installation or ask your own question. No ogr module despite having gdal installed?